Tucked in the northwest corner of Rhode Island, just 10 miles from both Massachusetts and Connecticut, is the village of Chepachet, where Phillips Steere Paine was born on June 8, 1930. When Paine was a teenager in the 1940s Chepachet didn’t have a high school, so each school day Paine traveled five miles north to the town of Burrillville to attend Burrillville High School. As of 2010, Phil Paine was the only player from the school to play baseball in the major leagues. Paine was the only son and the eldest of three children born to Arthur and Celia Paine, and he was named Phillips after Arthur’s best friend. (His middle name, Steere, is taken from an old Rhode Island family whose progenitor came to America in the mid-1600s). Arthur Paine had himself been a ballplayer, and from the time her brother was three years old, Marcia remembered, “Phil had a glove in his hand.” In fact, she said, Phil and his father were often opponents when local teams played each other. Beyond sports, Arthur Paine was also an avid outdoorsman who loved hunting and fishing, and Phil inherited the passion from his father. One of Phil’s Burrillville High School teammates, George Ducharme, recalled accompanying Phil on several hunting excursions; Ducharme never carried a gun, but he enjoyed walking along as Paine regaled him with stories. So fond was Paine of the outdoors, Ducharme said, that one day during the boys’ senior year, on the first day of the fishing season Phil skipped baseball practice to go fishing and was summarily benched for one game by his coach. Phil’s sister Marcia agreed that that sounded like something her brother would do but added that he could have missed a lot of practices and it wouldn’t have made much difference; he was just naturally that good. Indeed he must have been. In 2002, Paine was posthumously inducted into the Burrillville High School Athletic Hall of Fame. In addition to his baseball exploits (he played varsity for four years), Paine was a goaltender for three years on the hockey team; during his senior season, the hockey team, in those days a perennial powerhouse in Rhode Island Interscholastic League hockey, was undefeated in league play. On the mound, Paine led the Broncos to four Western Division league championships, and as a senior was named to the All-Class-C First Team by the Providence Journal-Bulletin. That year, 1948, was a singular season. In addition to Paine’s individual accomplishments, the Burrillville baseball team won the state high-school championship, as Paine outpitched his more heralded rival, Chet Nichols (whom Paine would later join on the Boston and Milwaukee Braves) in a thrilling 3-2, extra-inning victory over Pawtucket East, in a game played at the Brown University baseball field. (“Oh, that Nichols was a hothead,” recalled Marcia, who knew Nichols. “He was so mad when Phil beat him.”) On that day scouts were out in droves, “mostly to see Nichols,” recalled George Ducharme, who played in the game, “but after the game I saw Phil talking to some scouts.” Soon thereafter Paine signed a contract with the Philadelphia Phillies, and his professional baseball career began. That summer, Paine joined the Phillies’ Class D entry in the Pennsylvania-Ontario-New York (PONY) League, the Bradford (Pennsylvania) Blue Wings. In 12 games, the 18-year-old acquitted himself quite well. Making eight starts and tossing 97 innings, Paine recorded a 5-4 record with an impressive 2.41 earned-run average, although, not for the last time, he struggled with his control, finishing with 32 walks (and 35 strikeouts). Perhaps due to his youth, and despite his low ERA, Paine also proved somewhat inconsistent: While he pitched a 10-0 shutout late in the season to help give Bradford a fourth-place finish in the final standings, he was later shelled in a September 13 playoff loss to the Lockport Reds, surrendering eight runs and 15 hits before being pulled in the top of the seventh inning. Nonetheless, Paine showed much promise, and when the 1949 season opened he had earned a promotion. Beginning the season at Toronto, in the Triple-A International League, the right-hander had a brief tryout there in two games before settling in for the remainder of the season at Vandergrift (Pennsylvania), the Phillies’ team in the Class C Middle Atlantic League. Once again a starter, Paine hurled 202 innings in 35 games and his ERA ballooned to 5.48, as he was again victimized by a lack of control: 136 walks--an average of 6.1 per nine innings. That was Paine’s final season in the Philadelphia organization. In the offseason, on December 6, 1949, he was taken by the Boston Braves in the minor-league draft. (The Braves acted on the advice of their New England scout, Jeff Jones, who in 1948 had signed Chet Nichols.) Within a year and a half the Rhode Island native was pitching in front of Braves fans just 65 miles from his home town. Paine arrived in the major leagues via a timely sequence of events. He spent the 1950 season with the Hartford Chiefs, the Braves’ team in the Class A Eastern League. Pitching strictly in relief, he appeared in 30 games, posted an 8-3 record with a 3.12 ERA, and, perhaps most importantly, reduced his walks per nine innings to 3.1. It was a solid performance and earned Paine a scheduled promotion to Double-A, where the Braves intended for him to start the 1951 season with the Atlanta Crackers, in the Southern Association. Chance intervened. Before the start of the season Paine learned that he would be inducted into the Army in May. Rather than report to Atlanta, Paine asked the Braves to return him to Hartford so he would be closer to home until his call-up to the service. That spring Hartford had a new manager; Tommy Holmes, who had finished his sterling career with the Braves, was named player-manager to succeed Ripper Collins, who had resigned to take a radio announcing job. As May passed without a draft notice, Paine remained with Hartford into the summer, working both as a starter and in relief. By July 4, he had appeared in 17 games, made seven starts, and pitched 72 innings, amassing a record of 6-6 with a 3.50 ERA. He again suffered bouts of wildness, as his average walks increased to 5 per nine innings. In the meantime, there was a managerial change in Boston. On June 19, citing ill health, Braves manager Billy Southworth suddenly resigned, and Holmes was asked to come back and take over the struggling team. On July 4, in one of the first personnel moves of Holmes’s tenure, the Braves assigned reserve infielder Gene Mauch and pitcher Sid Schacht to their American Association club in Milwaukee and called up shortstop Johnny Logan from Milwaukee and Paine from Hartford. After just 96 games in the minor leagues, the 21-year-old from Chepachet was going to the majors. For his part, Holmes was glad to add Paine to the Braves’ pitching staff. Having watched the right-hander perform at Hartford, he was aware of Paine’s skills and was impressed not just with the pitcher’s physical ability, but also with his demeanor. Paine’s addition to the Braves meant there were three Rhode Islanders on the Braves’ pitching staff, the first time since the 1800s that three from the state played on the same major-league team. Max Surkont, who joined the Braves in 1950, had been born in Central Falls, and Nichols, who was in his rookie season, hailed from Pawtucket. Together, the three posted a record that year for Boston of 25-24, very respectable for a team that finished the season with a record of 76-78. Ten days passed before Paine got into his first game. On July 14, at home against the Cincinnati Reds, he made his major-league debut, in relief as the Reds shut out Boston, 5-0. Paine, wrote one sportswriter, “made an impressive major league pitching debut for the Braves, striking out four of the six batters who faced him in the last two innings.” Nine days later, in a 15-14 Braves win over Pittsburgh, Paine, the third of five Boston pitchers, collected his first victory, allowing three hits in two innings of relief. By season’s end, Paine had logged 35 1/3 innings in 21 games, won two without a loss, and posted a 3.06 ERA, though his walks remained problematic (20, or 5.2 per nine innings). That fall Paine was finally inducted into the Army, and it was be two years before he again took the mound for the Braves. When he did, the team no longer called Boston its home. Paine was sent for basic training to Fort Indiantown Gap, near Harrisburg, Pennsylvania. During off-hours the soldiers often spent time at one of their favoring watering holes, the Warwick Hotel and Restaurant in the nearby town of Hummelstown. There, Paine met Jeannette Orsini, whose father owned the inn, and they began a courtship. When Paine was sent to Japan, he corresponded with Jeannette, and after his discharge the two were married, in December 1953. It was a union that lasted 25 years, until Paine’s death, and produced three children: sons Dan and Jeff and daughter Sherri, and also eventually four grandchildren. After his marriage, Paine called Hummelstown his home. With basic training completed, Private First Class Paine was assigned to the Fifth Infantry Division and was sent to the US Army Personnel Center at Camp Drake, in Fukuoka, Japan, where he remained throughout 1952 and ’53. There he was eventually reunited with George Ducharme, his high-school teammate. Throughout 1952 and ’53 Paine remained at Camp Drake. Ducharme said that as new soldiers arrived at the camp, Paine would greet them and arrange for their lodging. “It wasn’t bad duty,” Paine himself later remembered. Most importantly for him, it gave him the chance to keep playing baseball. At some point, Paine signed with the Nishitetsu Lions of the Japanese Pacific Coast League. During his days off from duty the right-hander pitched twice a week for the Lions for $575 per game. The extra money undoubtedly came in handy as a supplement to Paine’s military pay, and when he returned to the States he recalled that “It turned out I was a pretty soft touch for a loan when my buddies ran short before payday. And some of them had short memories when it came to paying me back.” In nine games for the Lions, a total of 61 innings pitched, Paine compiled a 4-3 record and a 1.77 ERA. In November 1953 he was discharged from the Army, and he returned to the United States to resume his major-league career. Paine reported to spring training in Bradenton, Florida, to begin the 1954 season. The year before, the Braves had relocated to Milwaukee. During the 1953 season, Braves pitching coach Bucky Walters, anticipating Paine’s return to the mound in ’54, had said that “Phil could very well turn out to be a great addition to our staff when he is discharged from the service. He has all the necessary equipment to be a top-notch pitcher.” In particular, Walters said, Paine, who threw side-arm, possessed an effective sinker and curve, which made him an ideal candidate for a relief role. His development, it was hoped, would allow Paine to anchor manager Charlie Grimm’s overhauled bullpen in 1954. In the event, things didn’t quite work out as planned. Back in major-league harness, Paine simply couldn’t find the plate, although perhaps he wasn’t given much of a chance to prove himself. Grimm may have lacked confidence in Paine, or the right-hander may have had had some undisclosed injury. But after a brief outing on July 18, Paine had appeared in only 11 games and in 14 innings of work, he issued 12 walks, a hefty average of 7.7 per nine innings. On May 22 in Chicago, he was credited with his third career win (without a loss) in an 11-9 Milwaukee victory over the Chicago Cubs (Warren Spahn got a save in relief). But beyond that appearance there were few additional highlights. When the Braves purchased veteran left-hander Dave Koslo from their Toledo farm club on July 19 and assigned Paine to the Triple-A team, the assignment struck some observers as somewhat of a “surprise move.”  But it was a clear signal that Paine’s future with the Braves was anything but secure. In the spring of 1955 Paine failed to make the Braves’ team and was optioned to the Double-A Atlanta Crackers. His stay there was brief. Although he won two games without a loss, his all-too-familiar struggles with control once again predominated, as he walked 19 batters in 23 innings; those walks, along with 20 hits given up, combined to produce a 5.87 earned-run average. After a month in Atlanta (seven relief appearances), Paine was sent to Beaumont, in the Texas League. There, in sweltering summer heat, the Rhode Islander pitched well enough to earn a return to the major leagues. When Paine arrived in Beaumont early in May, he joined a team that was battling to stay out of last place. Desperately in need of pitching, the Exporters installed Paine as a starter, and the right-hander responded with one of the best stretches of pitching in his career. He once again harnessed his control, and the results were impressive: Paine started 14 games and completed seven, including a two-hit shutout in a 5-0 defeat of Fort Worth on June 21. With a .500 record in 12 decisions for a sub-.500 team, Paine struck out 95 batters in 118 innings; most importantly, he walked just 42, an average of 3.2 per nine innings. It was the best control he’d exhibited since his first professional season, and the Braves took notice. On July 6, when pitcher Joey Jay was sent to Toledo following the completion of his two-year roster requirement as a bonus player, Paine was recalled to Milwaukee to replace him. Paine pitched as though this chance would be his last. In one of the best performances of his major-league career, a four-inning stint at Brooklyn on August 2 during which he allowed just one hit and struck out six to earn his fourth career win. By then Paine had allowed just three hits and struck out 13 in 9 1/3 innings (five games) since his recall; with only one earned run allowed, his ERA was 0.96. He had never pitched better. It was perhaps Paine’s most effective performance. Although he ended the season with only 25 1/3 innings pitched in 15 games, Paine struck out 26 and limited his walks to 14, with an impressive 2.49 ERA. He won two games without a loss, and his career record now stood at 5-0. Yet despite that performance, in the end it didn’t matter; with the exception of two appearances over the next two seasons, 1955 effectively marked the end of Paine’s Braves career. For the next two seasons, he toiled almost exclusively in the minors. After making the team in the spring of 1956, Paine had appeared in just one game when the Braves optioned him outside the organization. Wichita, the Braves team in the Triple-A American Association, was interested in purchasing first baseman Don Bollweg from the Minneapolis Millers, the New York Giants entry in the same league. Minneapolis wanted a player in return, and on May 10 the Braves optioned Paine to Minneapolis to complete the deal. In 58 games, including five starts, Paine was 8-6 and pitched 116 innings, issuing 4.3 walks per nine innings. On August 29 he was recalled to Milwaukee, to report the following spring; on September 18 he surrendered a game-winning home run to Indianapolis’s Joe Altobelli in a Minneapolis playoff loss; and finally, on October 12, Paine was assigned outright to Wichita. As he returned to Hummelstown in the fall of 1956, the right-hander’s immediate future in the major leagues was certainly in doubt. Paine attended his last Milwaukee spring training in 1958. By then, in the estimation of manager Fred Haney, the pitcher was one of several who were “on the fringe”; and, exclaimed Haney, “it will be up to them to make [me] keep them around.”  In the end, Paine wasn’t kept. 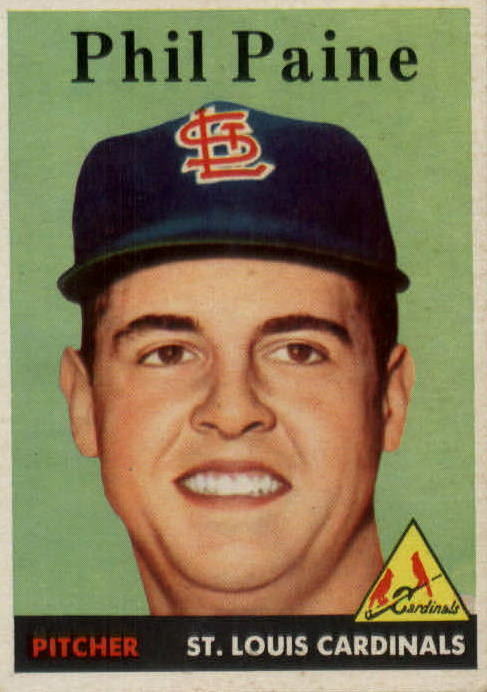 On April 15, 1958, Milwaukee asked waivers on the right-hander; he was claimed by St. Louis on the 19th. That season, Paine pitched his final 46 major-league games. He got off to a torrid start. On June 24, in Pittsburgh, he won his fourth consecutive game for the Cardinals, lowering his ERA to 0.79 and raising his career record to 9-0. By September, though, Paine had clearly tired and he split two more decisions, finishing the year with a 5-1 record in 73 1/3 innings and an ERA of 3.56. It had been a productive performance, but those were Paine’s final major-league innings. After the season Paine joined 19 teammates in a month-long exhibition tour of the Pacific. After departing on October 9 (the next day he was reassigned outright to Wichita), the team played 16 games, three in Hawaii; one each in Manila, Okinawa, and Korea; and ten at various stops in Japan. During the tour Paine won two games for St. Louis and also visited Camp Drake, where he renewed old friendships and also spoke at a luncheon held in his honor at the Non-Commissioned Officer’s Club. While he was in Japan Paine was offered another contract by the Nishitetsu Lions, an offer in which, he told the press upon his return to the United States, he was “definitely interested.” Although Paine ultimately refused the offer, it wasn’t the last one he received. On December 4, 1958, Paine’s brief Cardinals career was ended. That day he was part of a deal between the Cardinals and the Los Angeles Dodgers. St. Louis traded outfielder Wally Moon and Paine to the Dodgers for outfielder Gino Cimoli. Paine was assigned to the Dodgers’ Spokane farm club in the Pacific Coast League. A few days later Paine agreed to play for the Kintetsu Pearls of Osaka, in Japan’s Pacific League in 1959. A month later, however, he announced that he had changed his mind. He needed only 16 days of major-league service to qualify for a pension, so decided to try to make the Dodgers’ team. He told the press he had notified Kintetsu he would not join the team after all that season, but that if he failed to stick in the majors he would accept an offer to pitch in Japan in 1960. In February Paine joined the Dodgers at spring training in Vero Beach, Florida. He told reporters that Kintetsu had offered him “about double my present salary.”  But that he and his family had decided instead to remain in the United States. And that ended his deliberations with the Japanese. Paine failed to make the Dodgers squad in 1959; unfortunately for him, the club was loaded with pitching talent and he spent the entire season in Spokane (5-5, 3.25 ERA). In December Paine was part of a deal that sent him to Vancouver, a Baltimore Orioles farm club, and over the next two seasons he appeared in 116 games for the Mounties, all but one in relief. After the 1961 season, Paine retired at the age of 31. For the remainder of his life Paine ran the family inn, the Warwick Hotel and Restaurant, in his adopted hometown of Hummelstown. He coached Little League and American Legion baseball. On February 19, 1978, at the age of 47, he died of a brain tumor on February 19, 1978, at the Veterans Hospital in the nearby town of Lebanon, Pennsylvania. He was buried in the Hummelstown Cemetery. In his hometown of Chepachet, a baseball field is dedicated to the memory of the tall right-hander who made it out of the small town to the major leagues. Phil Paine player file, National Baseball Hall of Fame, Cooperstown, New York. Biographical sketch provided by Jeannette Paine. My sincerest appreciation to Jeanette Paine, widow of Phil Paine, who sent me several biographical documents related to her husband. My sincerest appreciation as well to Marcia Eddy, Phil Paine’s sister, with whom I spoke by phone on March 13, 2010. Telephone interview with George Ducharme, a high-school teammate of Phil Paine, on March 6, 2010. Telephone interview with Jeff Farrell, who heads the Burrillville High School Hall of Fame Committee, on March 9, 2010. March 6, 2010 telephone interview with George Ducharme, a high school teammate of Phil Paine. Ducharme said he remembered Arthur Paine, whom he referred to as old “Dan” Paine, as a 45-year-old spitball pitcher in a Sunday league. In his professional career, Ducharme returned to Burrillville High School as assistant principal. During his two-plus decades at the school, it presented the Phil Paine Award to the most promising baseball prospect. Marcia Paine said her brother was given his nickname, Flip, by a Burrillville teammate, Roland Warren. After the season Paine was honored in Chepachet with a testimonial banquet, where he was presented with a wristwatch. Ducharme told me that during Paine’s induction into the Burrillville High School Athletic Hall of Fame, he met Paine’s widow and family and had the opportunity to share this story with them. All quotations in this paragraph are from an unidentified clipping in Paine’s Hall of Fame player file. Unidentified clipping, Paine’s Hall of Fame player file. There is some discrepancy in the reporting of Paine’s return to Wichita. In his Hall of Fame file it is noted among his transactions that Paine was assigned outright on October 12. On October 13, however, the Associated Press reported that “[t]he Wichita Braves announced that Everette Joyner, OF, has been traded to the Milwaukee Braves for three players … Phil Paine (Minneapolis, American Association) and Jack Hannah (Jacksonville, SAL), pitchers, and Tobey Atwell (Miami, IL), catcher.” Regardless of the official transaction, as 1956 came to a close, Paine had rejoined Wichita. Although Paine was not on the Braves’ World Series roster, he nevertheless supported the team. His sister Marcia lived with Phil and Jeannette in Milwaukee during those days and got to know many of the players. One day several years ago, she related, Marcia was watching a documentary about Hank Aaron, whom she had known back then, and a segment aired from an interview Aaron gave during the 1957 World Series. She was never so surprised as when a player crossed the camera behind Aaron: It was her brother. Marcia laughed with pleasure when she related that story. UPI via Janesville [WI] Daily Gazette, date unknown.